Although the story has been repeated time and again, no book can mention the Hotel Duluth without telling the tale of how the hotel’s Black Bear Lounge got its name. Early on Sunday morning August 18, 1929, Arvid Peterson was driving down London Road with a truckload of fish fresh from the North Shore. At Twenty-sixth Avenue East he noticed a large black bear following his truck. The bear trailed him all the way to the corner of Superior Street and Third Avenue East—to the Hotel Duluth. The bear apparently lost its taste for fish when it smelled the food being prepared in the hotel’s coffee shop. It stood on its hind legs, swung a paw, smashed through a fifteen-foot-tall plate-glass window, then entered the hotel through the broken window and ran straight to the coffee shop. A man described by newspapers as a “local drunk”—either up very early or still out quite late from the night before, if his reputation was deserved—grabbed a hammer and followed the bear through the broken window. The would-be hero yelled and waved the hammer, facing down the bear. All the commotion woke night watchman Albert Nelson, who ran to the lobby to see what was the matter. When Nelson saw the bear, he quickly alerted the assistant manager, who called the police. Nelson and the drunk occupied the bear, the inebriated man waving his hammer as the night watchman threw tables and chairs at the hungry bruin. As the battle went on, guests rushed to the lobby, and the faces of curious passersby filled the windows. Soon a crowd had gathered. Duluth police officers Sergeant Eli Le Beau and Patrolman John Hagen answered the assistant manager’s call. Along with members of the crowd, the officers used a rope to try to lasso the bear. After avoiding capture, the bear appeared to be bearing down on Nelson. Fearing that the watchman’s life was in danger, Sergeant Le Beau raised his rifle and fired once, striking the bear in the head. The bear stood on its hind legs, wobbled for a moment, then fell down dead. The bear’s carcass was stuffed, mounted, and displayed in the front window of the hotel. When prohibition ended in 1932, the bear was moved to the coffee shop which then became, appropriately enough, the Black Bear Lounge. The lounge has since closed. 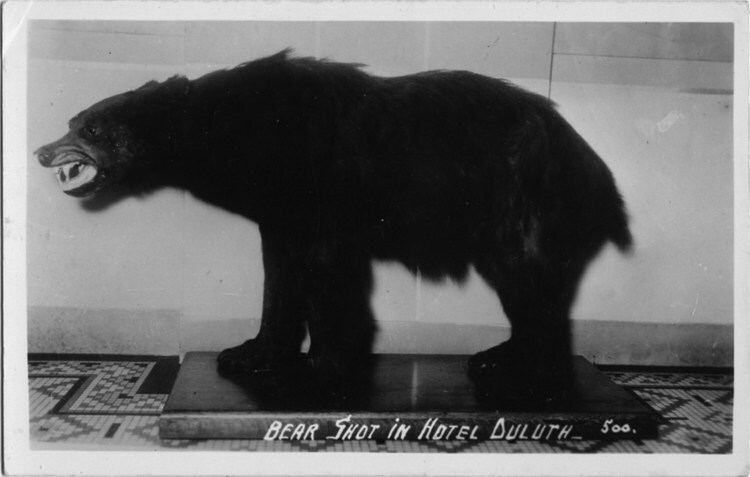 When the Hotel Duluth closed and was converted to Greysolon Plaza, the stuffed bear was purchased by Andy Borg of Grandma’s Restaurant and it went on display at the Grandma’s Saloon & Deli in Canal Park.